This tribute to Eugene Jarvis's seminal arcade shooter Defender features all the ingredients that made that game a classic. Inspired by Mutant Storm and featuring elements of the finest twitch games coupled with new and exciting features, Alien Abduction is the game shoot 'em up fans have been waiting for. 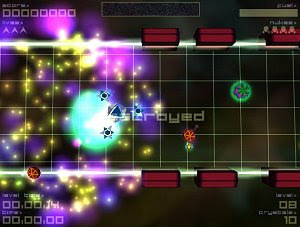 * 3 game modes: Points Battle, Time Attack, Sharp Shooter. * 30 levels spread over 3 missions. * 2 player action - battle your buddies on the high score table. * Awesome powerups to aid you in your mission. * Tactical depth - attack, defence and resource management. * Unlockable goodies - extra ships with different abilities. * Addictive gameplay that screams 'just one more go'.